Fire alarms are one of the most essential aspects of any facility’s physical security. Along with burglar alarms, these are the alarms that can really save lives, and the ones that must be operating at 100 percent all the time. However, even though they are essential,that doesn’t mean there isn’t room for improvement on the traditional fire alarm model. With modern IoT technologies, the fire alarm is adapting and becoming more versatile and useful not only in the warning of fires but in helping you evacuate properly when one is detected. In this article, we’ll go through the basics of fire alarms for work, and discuss one of the interesting new features — an integration with physical access control. How do fire alarms for facilities work? Though fire alarms are ubiquitous, their traditional design is not easily apparent. You can’t actually use a camera to see where there’s a fire, so how do you detect one? There are two main methods here that we’ll cover, with the first being temperature sensors, and the second being smoke alarms. The first of the two sensors we’ll cover here are temperature sensors. There is another article on the Kisi Academy page about them already that dives much deeper into the technical specifications, and gives recommendations and best practices, so we’ll stay pretty surface-level here. A temperature sensor essentially just checks the temperature in a room. Pretty simple! 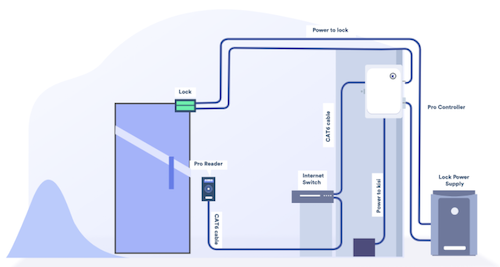 You can install it in rooms that need to be temperature-controlled, like server rooms, and connect it to smart home hubs or alarm panels to be notified when the temperature passes a given threshold. The issue with temperature sensors and fires is that often, by the time a fire is strong enough for the temperature difference to be felt, it’s too late and the fire is out of control. That’s why temperature sensors aren’t always reliable as fire alarms. The more reliable method is actually smoke alarms. In practice, most fire alarms that you’ll see are smoke alarms, and these are definitely the more reliable of the two categories of sensors. Smoke detectors detect any trace amount of smoke in the air. This can be visible smoke caused by, say, burning paper, or even the more dangerous invisible smoke that fire releases: carbon monoxide. Carbon monoxide is totally invisible and has no smell, and you won’t even necessarily start coughing if you inhale it. You slowly get sleepy as it replaces the oxygen in your lungs, and eventually, it will completely cut off oxygen to your brain, causing you to just doze off. This is why it’s so dangerous to humans: we can’t even tell when we’re being poisoned by carbon monoxide until it’s too late. Thankfully, smoke detectors can recognize even tiny amounts of carbon monoxide, and given that it’s only produced by fires, they’ll immediately raise the alarm if they sense it. We strongly recommend installing smoke detectors in your office for fire safety. Beyond the alarms themselves, you’ll need a dedicated alarm panel to route the alarm signals. 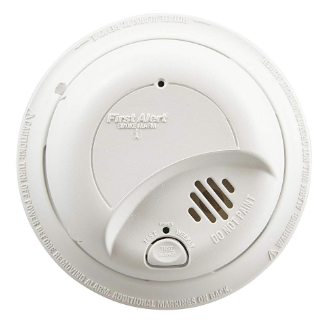 A smoke detector is in most cases an autonomous machine with some wires and specialized detectors, and it isn’t connected to your general alarm infrastructure unless it is wired to the alarm panel. The functionality of the panel is relatively straightforward, so instead, here we’ll go through a couple of recommendations for the more popular and versatile panels. In general, a panel is installed with its own sensors, so these can serve as recommendations for both! - The first here is the Bosch Panel. With an integrated IP solution and modern panels, they’re reliable and sleek and a solid option. - Fire-Lite panels, while they don’t come with their own sensors, are compatible with all the top sensors on the market, and provide dedicated and reliable alarm solutions. There are many other options out there, but these are just three good ones you could look into. However, with almost all larger office buildings, the building operator will set up the fire alarm, so this might not even need to be a decision you make yourself. What type of fire alarm do you need? For safety reasons, you always need a fire alarm, but there are different regulations for these based on different factors like the state you’re in, the building class or size, or the number of people in your office. There are many resources online to help you figure out what sort of fire alarm you’ll need. There’s also some more specific regulations like fire rating to look into. Whether or not you need to be compliant depends, again, on location and size of the building, among other things, but Kisi has actually written a doc on the most common type of compliance, UL compliance, and when you’ll need it. In the world of integrations between various aspects of your physical security, the marriage between fire alarms and access control is an evident one. If there’s a fire going on in the building, you definitely want people to have easy paths to exit, so ensuring that your doors are unlocked is key. How is the panel set up? Kisi has an article about our integrations with fire alarms — check it out here! As a summary, though, Kisi’s controller is wired to the lock power supply. For integration with fire alarms, a backup power controller is installed, and the backup power controller is then linked both to the fire alarm panel and to the Kisi power supply. When the fire alarm is triggered, it communicates this to the backup controller, which in turn triggers the Kisi controller to unlock all the doors. Simple as that, and it keeps the cost down on the Kisi controller. In terms of your building, if it has an integrated power system that you have little to no control over, the building will provide a cable to you to trigger the fire relays from the access control panel. So you, the tenant, will get your access panel and you’ll need to connect it to the building fire panel. Just a little extra step, but what would life be without unnecessary bureaucratic hoops? What happens to the doors if a fire alarm is active? Last section, we mentioned that the backup power controller will communicate with the Kisi controller when the fire alarm is triggered. What actually happens to your doors in that scenario, though? As you’d expect, when a fire alarm is triggered, all the doors automatically open. In the event of a fire, actual security is secondary to saving lives. It should go without saying, but in the event of a fire in your building, don’t try to save material possessions, just get yourself out! You’ll naturally want all the doors open to facilitate this, and that’s what Kisi is set up to do in these scenarios. 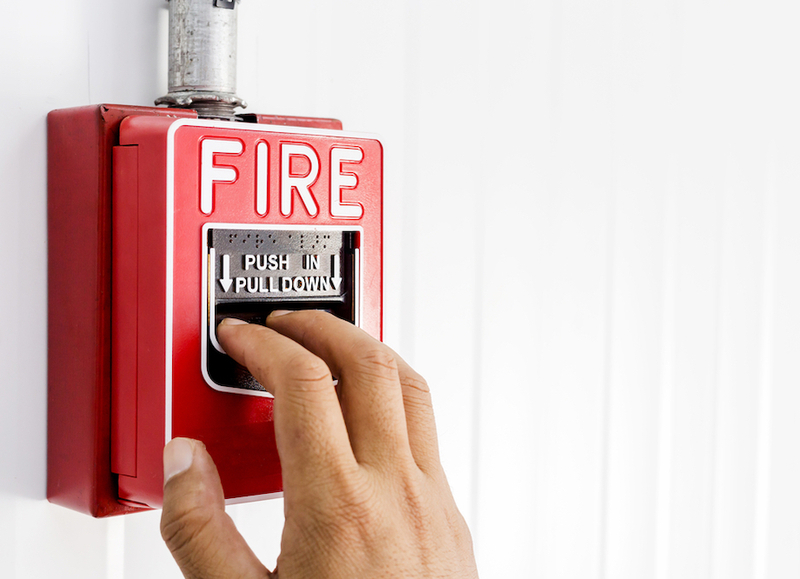 Fire alarms are a crucial component of any office’s physical security. With smoke alarms and heat detectors in all sensitive rooms, you’ll be fully aware of when a fire occurs. To automate the process of unlocking all your doors and allowing everyone to exit safely, you can also explore integrations between access control and fire alarms, like the one Kisi offers. With your fire alarms wired to your access control, you can ensure that you’re as prepared as possible if the worst should happen. How does a lockdown drill work? How does power loss in a building affect access control? How does internet loss in a building affect access control? How are access events supplied? How are access events supplied to law enforcement and auditors? 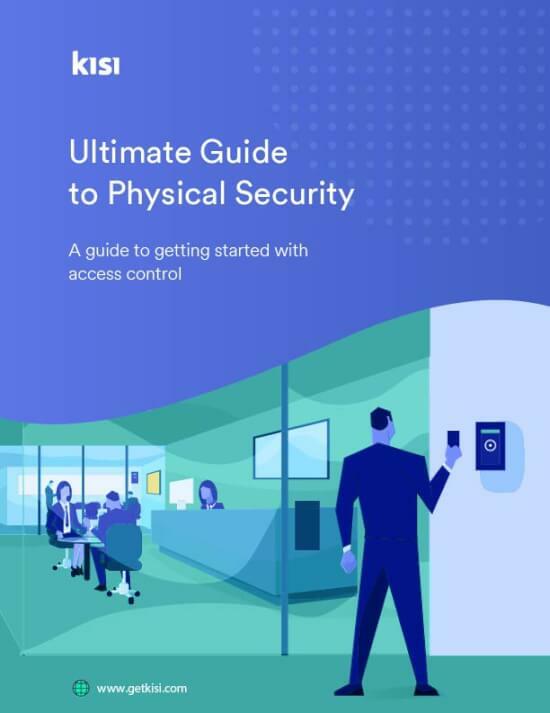 Join over 10,000 workplace leaders who use our guide to make more informed decisions about their physical security.